Imagine having to sleep on the streets to reserve your place in a line for the following day just to be able to submit a form at a government office whose job it is to receive these very forms. Now imagine if submitting these forms was the difference between being able to work legally with dignity or be at risk of detention and deportation to a place where your life may be in danger. You can imagine that the desperation may cause frustration, anger, maybe violence, and inevitably, a black market to trade the valuable appointments slips that one receives if they manage to be amongst the first in line in the morning. This is the situation you will see if you go to the Israel’s Refugee Status Determination (RSD) Unit on Salame St. in South Tel Aviv. 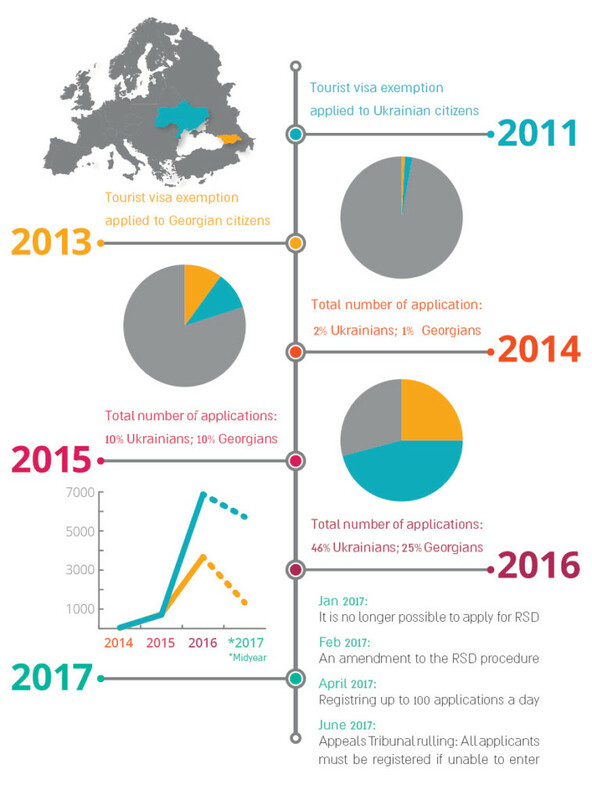 Over the last year and a half we have been monitoring the lines outside this office that have grown longer and longer since the increased arrival of Ukrainians and Georgians. As time goes by, not only has Authority not found a solution (for example, accepting the forms at more than just one office in the entire country, or online submission perhaps), the situation just kept getting worse. 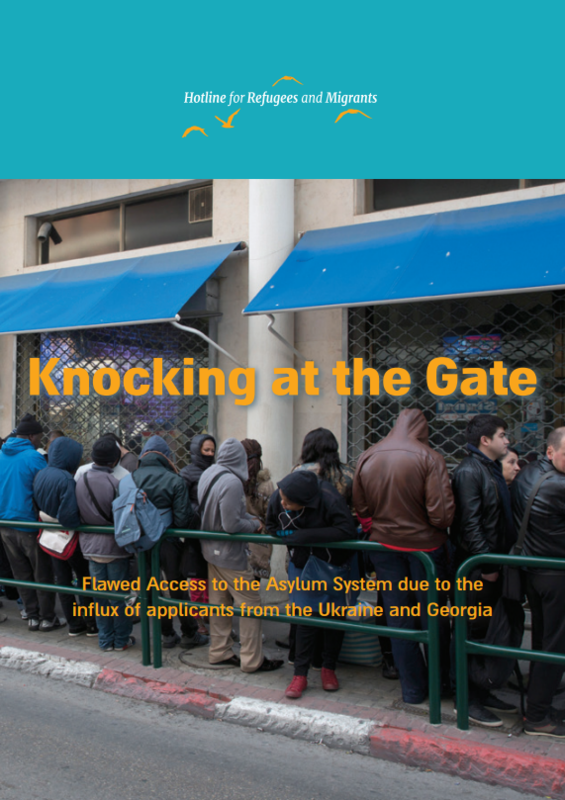 This month the Hotline has published a new report entitled “Knocking at the Gate” which details the impossibility to access the asylum system. Clients who contacted the Hotline informed us that as of January 2017, the RSD Unit stopped receiving new asylum applications – a violation of the country’s commitment to the Refugee Convention, and a contradiction from repeated claims by the Population, Immigration and Border Authority (PIBA) that they are operating an RSD system in line with international standards. Following our appeal with other human rights organizations, the offices began distributing appointments to approximately 70 to 100 people a day to be able to submit applications. For more than a year, we repeatedly warned the authorities about the flawed access to the asylum system and requested that they accept new asylum applications. After a lack of response, we filed a case with the Supreme Court demanding an immediate solution to the situation. It is inconceivable that thousands of people who seek protection will not be able to physically submit an asylum application because of impossibly long waiting lines. A person who has not been able to submit their application – even for reasons beyond their control – is at risk of arrest and deportation back to a place where their life may be in danger. The Hotline calls upon PIBA to produce through online submission, and to increase the number of offices and staff available to lodge applications. Furthermore, asylum applications must be handled within a reasonable period of time to ensure that Israel’s dysfunctional system is not being exploited, as we suspect it already is and have detailed in our earlier report “Through Hidden Corridors”.